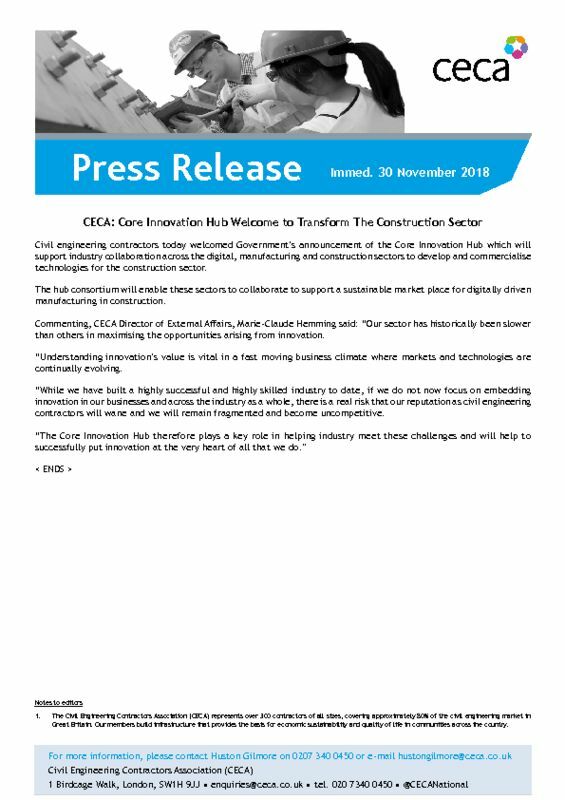 Civil engineering contractors today welcomed Government’s announcement of the Core Innovation Hub which will support industry collaboration across the digital, manufacturing and construction sectors to develop and commercialise technologies for the construction sector. The hub consortium will enable these sectors to collaborate to support a sustainable market place for digitally driven manufacturing in construction. Commenting, CECA Director of External Affairs, Marie-Claude Hemming said: “Our sector has historically been slower than others in maximising the opportunities arising from innovation. “Understanding innovation’s value is vital in a fast moving business climate where markets and technologies are continually evolving. “While we have built a highly successful and highly skilled industry to date, if we do not now focus on embedding innovation in our businesses and across the industry as a whole, there is a real risk that our reputation as civil engineering contractors will wane and we will remain fragmented and become uncompetitive.